A poniard /ˈpɒnjərd/ or poignard (Fr.) is a long, lightweight thrusting knife with a continuously tapering, acutely pointed blade and crossguard, historically worn by the upper class, noblemen, or the knighthood. Similar in design to a parrying dagger, the poniard emerged during the Middle Ages and was used during the Renaissance in Western Europe, particularly in France, Switzerland, and Italy. 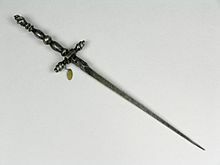 During the Safavid era in Iran (1501-1736), the army used the poniard; it was considered a weapon especially typical to have for soldiers who originated from the Caucasus region, particularly Circassians, Georgians, and Armenians. In modern French, the term poignard has come to be defined as synonymous with dague, the general term for "dagger", and in English the term poniard has gradually evolved into a term for any small, slender dagger. In literary usage it may also mean the actual act of stabbing or piercing with a dagger. The Fairbairn–Sykes fighting knife may be thought of as a modern version of the poignard. In Shakespeare's Hamlet (Act V, scene ii; line 3795), Laertes wagers "six French rapiers and poniards, with their assigns, as girdle, hangers, and so" against six Barbary horses owned by King Claudius that in a fencing match Laertes will defeat Hamlet by three or more touches. ^ "Brass-hilted Poignard". Ancient Edge. Retrieved 2007-01-10. Wikimedia Commons has media related to Poignards. This page was last edited on 7 June 2018, at 04:12 (UTC).